A recent article by the Washington Examiner begins to peel back the onion regarding the impact of decommissioning HSC-84 and 85. I would like to add some depth and put the argument in better context. The United States Special Operations Command’s rotary-wing deficit is one of the most important and consequential issues our Special Operation Forces face today. It is an elephant in the room and it only grows larger as SOCOM expands to contend with the requirements of the Global SOF Posture. 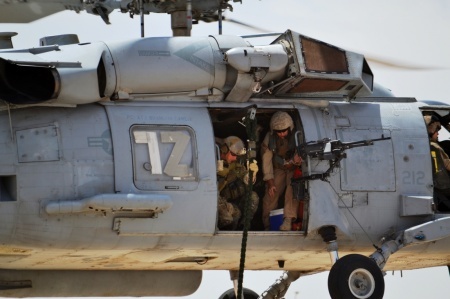 Simultaneous to the increase in demand for special operations capabilities, service-provided, SOF-specific helicopter assets are being stripped due to budget sequestration–namely the Navy-funded units HSC-84 and HSC-85. 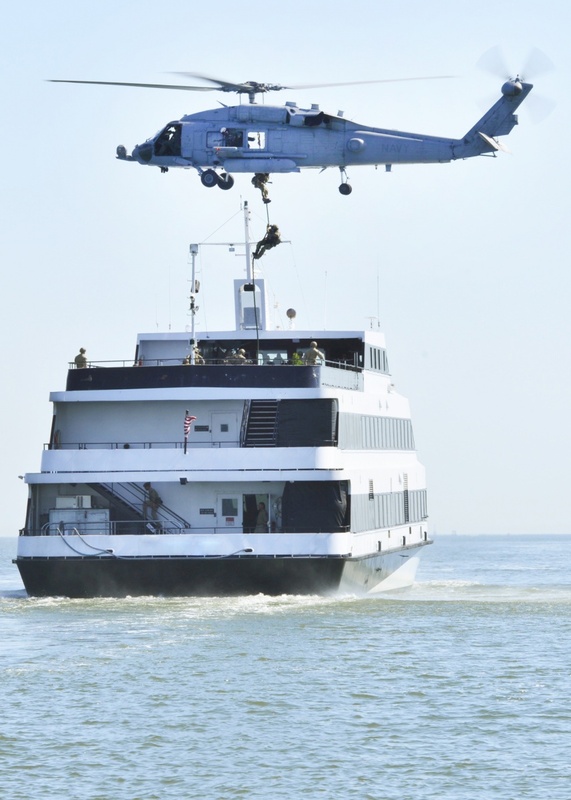 The cut is estimated to save the Navy only about $30 million in operational costs, a nominal sum especially considering the impact removing these units from the lineup will have. Currently, SOCOM is only able to fill 70% of helicopter air support requests with its current dedicated force, which consists of the 160th SOAR (A) battalions and HSC-84/85. The number of overseas requirements that go unsourced are certainly similar, if not greater, but the exact number isn’t readily available. With the 31% reduction in assets (44% reduction in medium lift Sikorsky H-60s) resulting from the decommissioning the Navy squadrons, SOCOM will only be capable of sourcing about 50% of its own requirements. More efficient use of SOAR airframes, one solution forwarded by SOCOM, simply will not fill the asset gap; there are just not enough helicopters to go around. SOCOM has also stated that it will utilize the AFSOC CV-22 to help cover the reduction in helicopter assets. This move could result in Osprey mission creep into particular mission sets more tactically appropriate for helicopters. While the CV-22 brings an incredible and unique capability to Special Operations, it is not a helicopter replacement. This potentially creates a dangerous scenario where the Osprey may be tasked beyond its capability. Right now the battle is being waged in the halls of Congress and the Pentagon, with the U.S. Navy on one side and SOF and their supporters on the other. Congressman Ryan Zinke (MT), himself a former Navy SEAL, introduced an amendment (now codified in HR. 1735 Sec. 1056) to the National Defense Authorization Act (NDAA) that would prevent HSC-84 and HSC-85 from being decommissioned until replacement units have been identified, trained to the appropriate level, and deployed to replace the specialized squadrons. “Zinke is fighting to keep the helicopter squadrons because they are highly specialized teams that exclusively support special operations,” according to Heather Swift, a Zinke staffer who was quoted in a separate report. Representative J. Randy Forbes (VA) has also signaled his support, stating the squadrons were critical to supporting maritime interdiction and special operations. In response to Congressional inquiries, the Pentagon is now scrambling to determine if re-tasking other units is a viable option. HSC-84 conducts fastrope training with int’l SOF during Eager Lion 2015, an annual SOF exercise in Jordan. But what would it take to transform two Navy squadrons to fill this role if the two units are decommissioned? Consider this: After the Navy decommissioned one of its two dedicated squadrons in 2006 (HCS-5) and then–in response to a request from SOCOM–reactivated it in 2010 by re-tasking HSC-85, it took over 2 years of training for that squadron reach full operational capability. That timeline was only achieved with the assistance and guidance of HSC-84, which had continued in its SOF support role after the deactivation of HCS-5 in 2006. HSC-84 trained extensively with HSC-85 in order to get them up to speed during their build-up period. HSC-84 fastropes a United States Coast Guard MSST element to a vessel during a cross-training event. Even with Congressmen Zinke and Forbes in SOF’s corner on the issue, victory is anything but assured. Other members of the House have failed to take action on the issue and the specialized squadrons have yet to garner the support of even a single Senator, but not for lack of effort by veterans seeking to halt the decommissioning of the units. With DoD authorization and budget in its final days of revision in Congress, the squadrons could conceivably slip through the cracks. Without doubt, the fact these units are operationally funded through the Naval Reserve made them easy targets for the Navy. The personnel staffing the unit are a blend with a significant, if not a majority, of Active Duty personnel in the ranks. Most of the reservists assigned have served the squadrons on long active-duty tours since the beginning of GWOT, making them the most operationally experienced aircrews in the Naval Helicopter community. The reserve personnel, especially the pilots and gunners, have given the squadron a degree operational continuity to contend with the rapid transfer cycle of Active Duty personnel, who usually only serve tours at the unit for 4 years or less.This issue is something squadron leaders have repeatedly asked the Navy to rectify with closed-loop manning, a system that would allow the highly trained pilots and gunners to re-tour more easily at the units. The Navy has repeatedly declined to take action on that request. One thing is for sure: Only a government bureaucracy would be capable of making such a logic-defying decision in the first place. Considering the clear and present requirements for SOF in today’s chaotic world, the fact DoD could produce this solution should blow the minds of most citizens…or sadly, maybe it doesn’t. As for us–the veterans of the predominantly 21st-century conflict–this type of dysfunction is part of the reason we retired or chose to separate from the military to begin with.